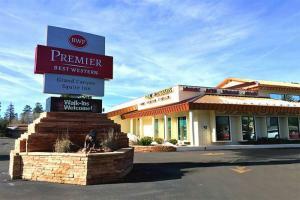 Situated only a mile and a half from the entrance to Grand Canyon National Park, the Best Western Premier Grand Canyon Squire Inn provides guests withcomfortable accommodations, great value, and unmatched convenience. Each spacious and well-appointed guest room features an LCD TV, a microwave, a refrigerator, and an iHome docking station. Take advantage of the many hotel amenities including an indoor pool and hot tub, well as an outdoor pool, open seasonally, a fitness center, a bowling alley and an arcade. Situated 1.5 miles from the Grand Canyon National Park entrance, and about an 80-minute drive from Flagstaff Pulliam Field Airport.